Passed away peacefully at Altnagelvin Hospital, Margaret, Edenvale care Home. Much loved daughter of the late Robert and Annie, dear sister of Glenn, John, Sammy and the late Nora and Jeannie. Dear friend of Mary. Funeral service in Edenvale Care Home on Tuesday at 2pm followed by interment in Aghanloo Parish Church. (funeral private). 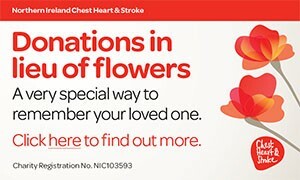 Family flowers only please donations is desired to Edenvale Care Home c/o Browns funeral Directors 25 Church Street, Limavady. Will be very sadly missed by her entire family circle. I am sorry to tell you that Margaret MILLAR has passed away.